TORONTO, ONTARIO, December 12, 2018 – Toronto Real Estate Board President Garry Bhaura announced that TREB Commercial Network Members reported 1,782,401 square feet of total leased space across the industrial, commercial/retail and office market segments. This result represented a 23.9 per cent decline compared to November 2017. Almost two-thirds of space leased through TREB’s MLS® System was accounted for by the industrial market segment in November 2018. Year-over-year changes in average per square foot net lease rates, for transactions with pricing disclosed, were positive for all three major market segments in November 2018. The average industrial lease rate climbed to $7.84, a 15.5 per cent increase compared to November 2017. The average office rate also climbed from $12.88 in November 2017 to $16.74 in November 2018. The average commercial/retail lease rate increased 4.5 per cent from $22.64 in November 2017 to $23.64 in 2018. It is important to note that annual changes in average lease rates can be the result of changing market conditions and changes in the mix of properties leased from one year to the next, in terms of location, size, mix and other related factors. “While there are certainly issues of concern facing the economy, including recent announcements in the automotive industry and pressures facing the oil and gas industry in Canada, the GTA economy remains strong. The unemployment rate remains near historic lows in the region. As we continue to create jobs across many economic sectors, the demand for commercial real estate should remain strong,” said Mr. Bhaura. There were 46 combined industrial, commercial/retail and office transactions reported through TREB’s MLS® System with pricing disclosed in November 2018 – down from 57 transactions in November 2017. Annual changes in average sale prices per square foot were varied based on changing market conditions and changes in the mix of properties leased from one year to the next. 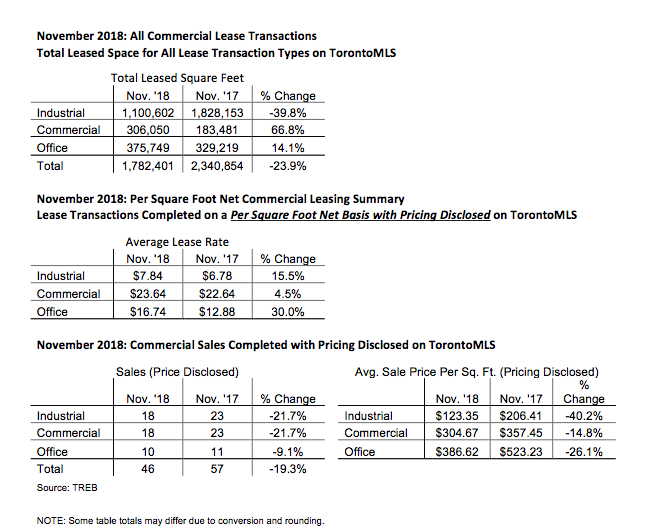 The post TREB Releases November Commercial Market Report appeared first on TREB Wire .